Saving Mr. Banks is more than a movie about bringing Mary Poppins from the page to the screen. It is a tribute to Walt Disney and his incredible team of filmmakers. The biographical drama follows the journey of adapting P.L. Travers’ Mary Poppins books into the feature film we all know and love. Emma Thompson plays a lovely stoic and proper Mrs. Travers. 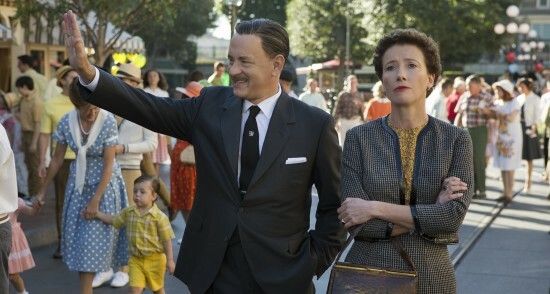 She is the perfect contrast to Tom Hanks’ enthusiastic Walt Disney. Exclusive clips shown during D23 presented a film that is both entertaining and poignant. The movie is the first time an actor as portrayed Disney in film but Hanks is more than up to the task. He brings Disney’s signature warmth and excitement to the screen with ease. Supernatural stories are all the rage these days. That’s especially true when the story concerns young love and the possibility of lots of pain and suffering. There’s a new movie coming up that’s looking to take its place among the other successes that tell this similar tale. It’s called Beautiful Creatures, based on the novel by Kami Garcia and Margaret Stohl, and it has a brand new trailer on iTunes. Beautiful Creatures tells the tale of two star-crossed lovers: Ethan (Alden Ehrenreich), a young man longing to escape his small town, and Lena (Alice Englert), a mysterious new girl. Together, they uncover dark secrets about their respective families, their history and their town. Sounds interesting. Look for Beautiful Creatures, which is written and directed by Richard LaGravenese and stars Alden Ehrenreich, Alice Englert, Jeremy Irons, Viola Davis, the amazing Emmy Rossum and Emma Thompson, to hit theaters on February 13, 2013. The titan of quality that is Pixar might have stubbed it’s toe last year with the release of the sub-par Cars 2, but that doesn’t change the fact that they are still riding a nearly two decade long winning streak. Creatively, their mandate of doing what isn’t expected has paid off in droves. What makes Brave such an interesting next step for Pixar is the fact that it is the first film with a female lead who is for all intents and purposes a princess. That’s right, this is a classic Disney princess fairy tale, but done the Pixar way. Fans of Disney and Pixar have reason to be very excited at that prospect. Disney has just released a third trailer for the film, but instead of just hyper cutting more footage to beautiful music, they opted for an extended scene that does a brilliant job of summing up the general conflict of the movie. You can tell immediately that this film has that Pixar charm we all know and love. There are very little studios these days that you can bank on having a hit just about every time they release a film. Sure, there will always be Cars 2, but that’s only after nearly a dozen award-winning, amazing films. That’s why we have no doubt that the next project in the Disney/Pixar house, Brave, will be anything short of genius. With a pretty stellar cast of Scottish actors and actresses, you can expect this film to bring new-found love to the kilt-wearing pure bloods proud to hail from Scotland. Here’s the premise for those not in the know. In “Brave,” a new tale joins the lore when the courageous Merida (voice of Kelly Macdonald) confronts tradition, destiny and the fiercest of beasts. Merida is a skilled archer and impetuous daughter of King Fergus (voice of Billy Connolly) and Queen Elinor (voice of Emma Thompson). Determined to carve her own path in life, Merida defies an age-old custom sacred to the uproarious lords of the land: massive Lord MacGuffin (voice of Kevin McKidd), surly Lord Macintosh (voice of Craig Ferguson) and cantankerous Lord Dingwall (voice of Robbie Coltrane). Merida’s actions inadvertently unleash chaos and fury in the kingdom, and when she turns to an eccentric old Wise Woman (voice of Julie Walters) for help, she is granted an ill-fated wish. The ensuing peril forces Merida to discover the meaning of true bravery in order to undo a beastly curse before it’s too late. Strong female hero? Majestic setting? It’s a definite that Brave has the stuff Disney legends are made of, but what do you think? Take a look at the trailer after the jump and sound off! Brave hits theaters on June 22nd. It was unfortunate when Disney and Pixar broke up over creative differences a few years back. For a time, albeit brief, there were thoughts that the two iconic animation studios would never reconcile their differences and get back together for us. Turns out, we were wrong, as they got back together almost immediately and have been cranking out amazing films since. Mostly sequels to their franchises, those films had a built in audience. Now, they’re branching into less familiar territory with their newest fantasy film, Brave. Here’s a rundown of the premise. Brave is set in the mystical Scottish Highlands, where Merida (Kelly Macdonald) is the princess of a kingdom ruled by King Fergus (Billy Connolly) and Queen Elinor (Emma Thompson). An unruly daughter and an accomplished archer, Merida one day defies a sacred custom of the land and inadvertently brings turmoil to the kingdom. In an attempt to set things right, Merida seeks out an eccentric old Wise Woman (Julie Walters) and is granted an ill-fated wish. Also figuring into Merida’s quest — and serving as comic relief — are the kingdom’s three lords: the enormous Lord MacGuffin (Kevin McKidd), the surly Lord Macintosh (Craig Ferguson), and the disagreeable Lord Dingwall (Robbie Coltrane). A pretty stellar voice cast, with Journeyman’s McKidd and Late Night Guru Craig Ferguson, but will the film hold up against the other epic franchises like Toy Story and Cars? You’ll have to decide on June 22nd when it hits theaters. In the meantime, check out the newest teaser for the film after the jump.